Outback Sheds offers an endless choice of wood storage sheds. Our Outback Wood Products consist of the Outback Gable Ranch Shed, the Outback Wood Storage Barn, the Outback Lean-to Shed and the Outback Redwood Gazebo. We offer complete on-site installation. Look over our portfolio of Outback Wood Products. If you cant find what youre looking for or have a question, give us a call. Our House style Gable Shed has been a favorite shed style for many of our customers over the years. We offer it in over 60 sizes and a choice of different wall heights. With numerous options such as windows, doors, shelving and more, youll love the freedom to customize your shed. Standard Gable sheds and Tall Gable sheds. For you Barn lovers, an Outback Wood Storage Barn is a must have. The Outback Barn is offered in several wall heights and makes a good choice for customers wanting overhead Loft Storage. Using the finest grade materials, your Outback storage barn will serve you well for many years to come. Standard Barn sheds and Tall Barn sheds. An Outback Lean-to Shed works well up against an existing structure. The Lean-to shed is a good choice for a side yard as well. The wall height can be custom tailored to meet your needs. 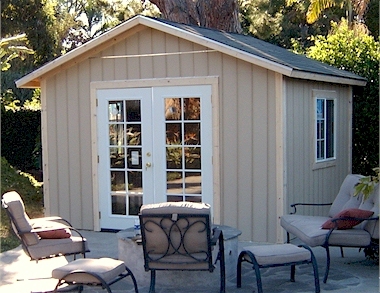 An Outback Custom Shed can be designed to your specifications. Chances are Outback Sheds can build the shed the way you want it, be it a special size, wall height, or custom features. Outback Redwood Gazebos offer instant beauty in the yard or garden. Redwood is the #1 choice for outdoor wood projects because of its natural resistance to water decay and insects. Various sizes available. San Diego County, Los Angeles County, Orange County, Riverside County, San Bernardino County. Web Design, Development, Hosting, & Maintenance by The CyberSide & Co.
All contents copyright © The CyberSide & Co., 1998-2017. All rights reserved.